With next week’s performance by Joshua Bell, Santa Barbara will have twice hosted the renowned violinist in a span of only seven months. But I don’t think anybody is getting tired of him anytime soon. For one, he’s Joshua Bell, after all! And two, the concerts show very different sides of his artistry. Last March he came here with the Academy of St Martin in the Fields Orchestra (courtesy of CAMA), whereas Tuesday he will play an intimate recital with Italian pianist Alessio Bax (courtesy of UCSB Arts & Lectures). Despite being only 46 years young, the American violinist and conductor has recorded critically acclaimed albums for nearly three decades. Bell has served as Music Director for the Academy of St Martin in the Fields since 2011—the first person after founder Sir Neville Marriner to hold that position in the 55 year-old ensemble. Bell and the Academy orchestra have just released an unusual and very exciting recording of works by J.S. Bach. Bell’s connection with the composer runs deep. When the violinist first debuted as soloist with an orchestra—at age seven—it was to play a concerto by J.S. Bach. And today when Bell first lifts his violin in the morning, it is Bach that warms and loosens his fingers and bow. Yet, so great is his reverence for the Baroque master’s music, and so firm is his conviction that ripeness is all, that Bell has put off recording Bach until this moment. The CD, titled “Joshua Bell: BACH”, features gorgeously detailed interpretations of violin concertos No.1 and No.2, crisp and swift in the outer movements, breath-stopping and deep in the middle. Bell’s articulation and technique are wonderfully fresh. And, as if that were not enough, the album includes the Air from the Orchestral Suite No.3, and two surprises: orchestrated takes on two movements from the unaccompanied Partitas, including the wondrous Chaconne from Partita No.2. Violinist and arranger Julian Milone was called upon to expand Felix Mendelssohn’s piano accompaniment to the Chaconne, as well as Robert Schumann’s piano accompaniment to Gavotte en Rondeau from Partita No.3. Bell has no illusions that these never-before-heard versions will supersede the originals, but they encourage us to hear the familiar from a new angle; and—what’s more—they permit us to listen to Bach through Mendelssohn’s and Schumann’s ears, and perhaps detect what tickled their fancy. 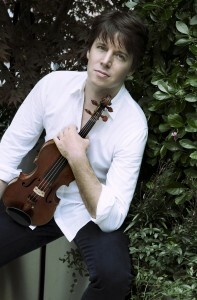 Last week Joshua Bell spoke to me by phone from his New York home. JM: Santa Barbara is fortunate to receive you twice in seven months! JB: It’s great for me; I hope it’s okay with Santa Barbara. I seem to be a regular there now, and I love it. I look forward every time to coming to that incredible place. JM: I’m wondering about your reverence for J.S. Bach. You have shown reticence for recording his works so far during your career. I am reminded of cellist Mstislav Rostropovich. Early in his career he recorded two of the six cello suites, but then came to regret it. He was nearly seventy by the time he felt ready to record all six unaccompanied cello suites. JB: Well the equivalent for the violin would be the Sonatas and Partitas, the six of those, which I still have not and will not do, yet. There is a kind of reverence for these pieces, and you want to do it right if you’re going to do it. In this case it’s not that I avoid recording Bach, it’s just that I don’t make any recording until it feels ripe and ready—to have the right collaboration and feel enough performances under my belt, and enough living with the music, that it feels like the right time. Like especially my collaboration with the Academy of St Martin in the Fields—I’ve been touring with them for the last decade, and doing a lot of Bach, and so the time was just right. You know, Bach’s music is really some of the greatest. I think in some ways Bach is the most profound composer of all. I’m glad I finally got around to it. JM: The new CD features newly orchestrated versions of movements from the unaccompanied partitas. Bach, of course, is famous for reworking his own pieces into alternative instruments and arrangements. Do you think this gives us implicit license for rearranging Bach? JB: I think at a certain level that does give license. In fact you have to look at the way music was viewed in Bach’s time. First, he would take a keyboard concerto and transcribe it for violin. The idea of an original version wasn’t thought of in that way. This music was something that could be done in so many different ways, and going into the 19th century the approach was clearly that music was something adaptable and changing all the time. Mendelssohn and Schumann and others did arrangements. In a way the highest praise you could give to a composer like Bach was to take and make your own arrangement; it was sort of an homage to that composer and to his work. And so it wasn’t considered sacrilegious to do something like that. It’s only recently, I think in the past 50 years, that there’s been this hesitance to alter music, with this quest for “authenticity” reigning supreme. I happen to love arranging things for the violin, doing things in different ways. I’ve always done that, whether it’s the West Side Story suite of Bernstein, or Porgy and Bess. I’ve done several albums of arranging opera arias and things for the violin. I love celebrating music in different and unique ways. By doing that you’re not saying ‘this is the way it should be’ or ‘it’s better than the original.’ It’s just a different way to look at the piece and enjoy the piece. So, in the case of the Chaconne, it gives you a glimpse into how the mind works of Mendelssohn as well as Bach. And it’s a way for me to play this great music with my orchestra, the Academy of St Martin in the Fields. It would have been kind of strange to have the solo Chaconne in the middle of an orchestral record like this. [This] orchestral version—this is really the first time it’s been done this way. We’ll see if anybody ever wants to do it this way again. For me it was a lot of fun, and makes the process of putting together a new arrangement. I mean the original is still the best—you can’t improve upon the original. Someday I’ll record the original as well, along with other Sonatas and Partitas. JM: Would you offer a few thoughts on the program for the upcoming recital with Alessio Bax? I see the works are arranged chronologically: Schubert’s Sonata for Violin and Piano in A Major, Op.162; Grieg’s Sonata for Violin and Piano No.1 in F Major, Op.8; and Prokofiev’s Sonata for Violin and Piano in F minor, Op.80. One marked contrast is between the sunny youthful quality of the Grieg, and the Prokofiev, which begins with the piano walking pensively, slowly, while the violin sings a lament overhead. JB: Well I like contrasts, and I like variety in a program, and yet you like things to be connected as well. For me, the first half—well, Schubert, I don’t want to say it’s sunny because Schubert for me even at its sunniest always has a tinge of melancholy—beautiful melancholy, you might say. And the Grieg—I always love Schubert and Grieg together, I’ve played different Schubert pieces with different Grieg sonatas. They go very well together because they’re two great melodists. Both use folk-like elements, and it goes so well together. But the first half is generally more sort of positive and sunny, and you couldn’t [follow with] a more heavy, darker piece than the Prokofiev F minor—which itself is such a contrast to his other sonatas, for example the D Major. The F minor is very heavy and brings out a lot of tragic moods, which is more accentuated when you’ve had a contrasting first half. I wouldn’t want to do a whole program with pieces as heavy as the Prokofiev, but you’re somehow ready for it at the beginning of the second half, to delve into that. And probably after that I’ll lighten it up with a few bonbons, I guess, to relieve [the tension] and send people away in a good, happier mood. But having said that, there is incredible beauty in the Prokofiev. It’s not just [darkness], and the piece itself is full of incredible contrasts. [For example] the slow movement of the Prokofiev: if the piece is about death, then the slow third movement is about heaven. He captures this incredible ethereal heavenly magic. JM: Listening to your description makes me think programming is a bit like playwriting, developing a line of dramatic development and decline. JB: A little bit. I mean the real architecture happens within the works themselves, and that was done by the composer. That’s where the real skill is. Putting together a program you are more a curator, but that’s important as well. And then the interpreting of it is where our big job is. It is an important thing to put together a program that gives the audience a little bit of everything, in this case. It’s fun to put together a program—it’s like putting together a meal well. You want to have things that are [balanced]; you don’t want it to be too heavy on sweet things, you want contrast. And for me I always like to do at least one new piece on a program that I’ve never done before. And in this case the Grieg is a revelation for me, this first [violin and piano sonata]. I’ve done the other two many times in my career, and this is the one left that I hadn’t done, so I’m very excited about it. It’s hardly played, and—as I’m discovering as I start to rehearse it with Alessio—it’s a gem of a piece that should not be ignored. It will probably be a first for most of the listeners—which is always nice.